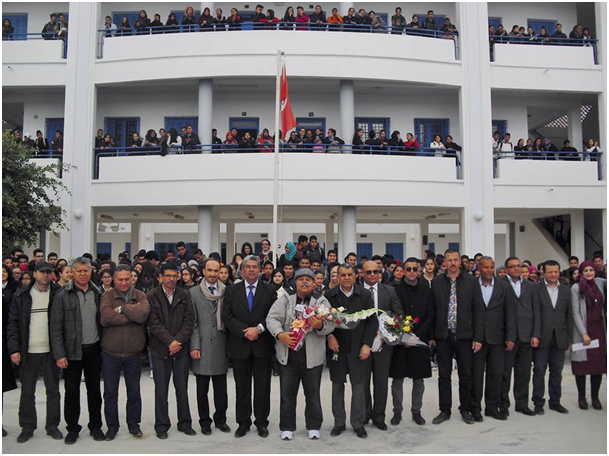 Aissa Chtourou (Regional Commissary of Education - Sfax), Ahmed Belghith (Director of Ibn Rachik High School), and his staff Yassine Kharrat recently welcomed Nejib Belheldi at the Ibn Rachik High School in Sfax, Tunisia. Belhedi explains the background of the photo above. "The Ouma students were enjoyed about my visit. With them, I realized that the Ouma ("swimming in the sea") revolution is continuing deeply in Tunisia; there is no stopping this. It is the will of the students of Tunisia as part of a greater community. Ouma gives the wings to these future young swimmers." Like the local school districts around Burghausen in Germany where students can get introduced to winter swimming and train for ice swimming, and many schools and universities in Japan where sea swimming is part of the educational curriculum required for graduation, the Ibn Rachik High School in Tunisia became the first Ouma High School in Tunisia. "I have to give much gratitude to the regional transport company for offering bus rides to kids to the Sfax beach for Ouma training sessions. I'm so happy to see Ouma spreading. Ouma - swimming in the sea - is the solution for a country that does not enough swimming pools. Even if a few swimming pools exists in a few cities, swimming [in pools] is too expensive for families. The training lanes are crowded and are often closed. Ouma in our seas and in dams and lakes...is the solution."